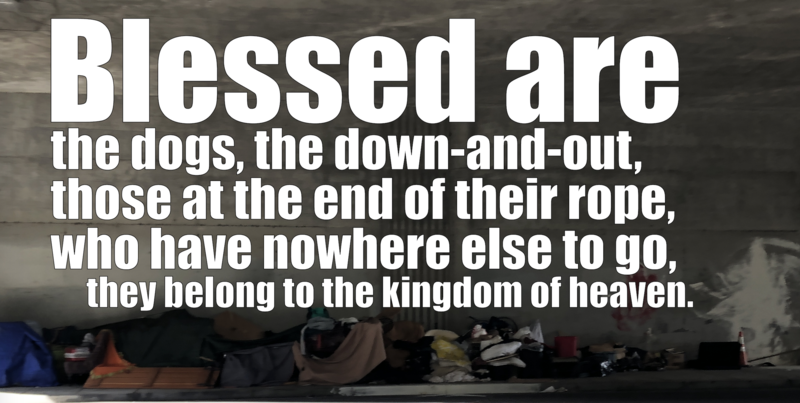 We begin our Fall series on the Beatitudes with the first of the 8 sayings of Jesus recorded in Matthew 5:1-12. They are the foundation for the larger teachings Matthew records together in his gospel version which we commonly call the Sermon on the Mount (Matthew 5:1-7:29). Throughout the history of those who have followed the teachings of Jesus and claimed him as spiritual master, the Beatitudes have been identified as his vision statement, the constitution of his reign: the kingdom of heaven, his right-side-up vision of our upside-down-world. But while we take it seriously, many in the church have said not to take it literally, seeing it as a poetic portrait of what Jesus wanted, not what he was making happen, or not concrete ways by which we should live. I mean can we really embrace nonviolence and be safe? What about security, if we seek poverty how can we protect ourselves? Jesus teaches to a crowd made up of his disciples and other people. At the end of the sermon (in Matthew 7:29) we’re told that the crowds were amazed by his authority. How did they take his words? Seriously? Metaphorically? Or literally? The crowds were made up of the sick, socially outcast, and broken-down. It’s what we’re told in the setting up of the context of the teaching in the prologue Matthew narrates in Mathew 4:23-25. Beatitudes were sayings that were used as a teaching tool in the ancient world. Yet more often than naught, being blessed (the beatitude) related to prosperity, safety in acquisition, being on the right side of history (or whoever was ruling it at the time). Here Jesus says the opposite, radically subverting the way in which we are invited to approach life and understand God’s passion and purpose. Poor in spirit. I’ve heard it said that it can mean the literal poor, who have nothing. It also could refer to those who are humble, contrite, recognizing their need of God (even if they are prosperous on earth). What the expression means is someone who is down-and-out, at the end of their rope, who has no more doors to open, nowhere else to turn: a dirty dog. The story of the Canaanite woman relates in that she is poor in spirit (Jesus seems to think of her a dog), ethnically other, social outcast, aggressive. Yet in her assertive relentless pleading for help for her child, Jesus opens to a new way of being, thinking, loving and seeing. Could it be that Jesus is saying such openness – when everything is closed – is the beatific key to the meaning of life and personal knowledge of the kingdom of Heaven – God’s better way? How, when, have you experienced poverty of spirit? How can such literal poverty lead to a literal blessing? Who do you glimpse as a dog to avoid in your life, our church, our city? How might God be inviting you to open yourself to the reign of God through that situation? Download the Text Study Sheet we use @CAPCOakland HERE.